Today's giveaway is sponsored by...a DUDE! Yes, you heard right! Dave of Octopus Party Nail Lacquer was one of the very first people to enthusiastically join the Friend-An-Indie-Friday giveaway series and he's just as passionate about polish as any woman I've met, including myself! It was such a pleasant surprise to see a guy appreciate and join in our love of polish--he gets us, ladies! So we can rest assured that his products are made with the full extent of his creativity and passion. Of course, as always, along with the giveaway, I will have an interview AND my very first review of the prize polish for you! 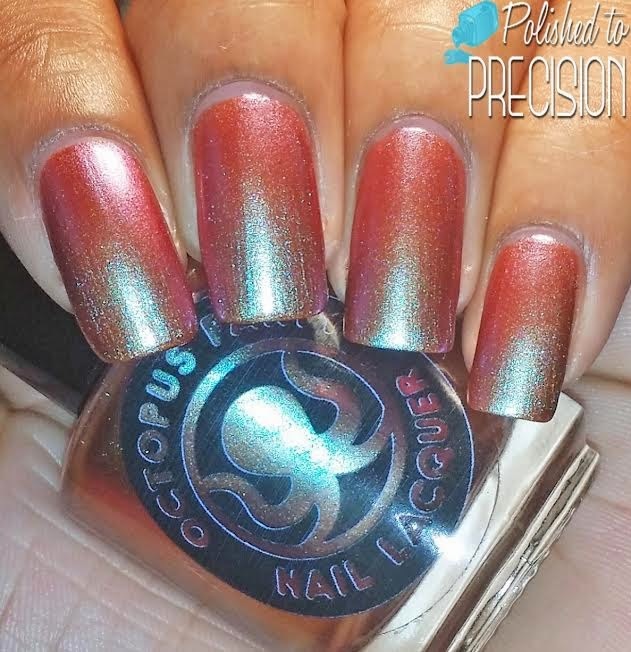 For this giveaway, Dave is giving away a full-size bottle of Shore Fire, shown swatched below by my girl Tiffany of Polished to Precision, to three lucky winners! It's not currently available, but his Twice As Ice might be my favourite! But I have Laguna Bleach, Spume Fed, and Water Glass on their way to me. OPNL polishes are just awesome. Wear like iron too! Would have to be this one, Shore Fire! I have had my eye on these polishes for awhile, and I like a lot of them, but Shore Fire isn't like anything else I have, so I LOVE it!